Whilst, as its name implies, the term specific heat capacity is used in internal energy calculations where the energy transfer is by heat, it is also used when the energy transfer is by mechanical means, i.e., by doing work on a body. 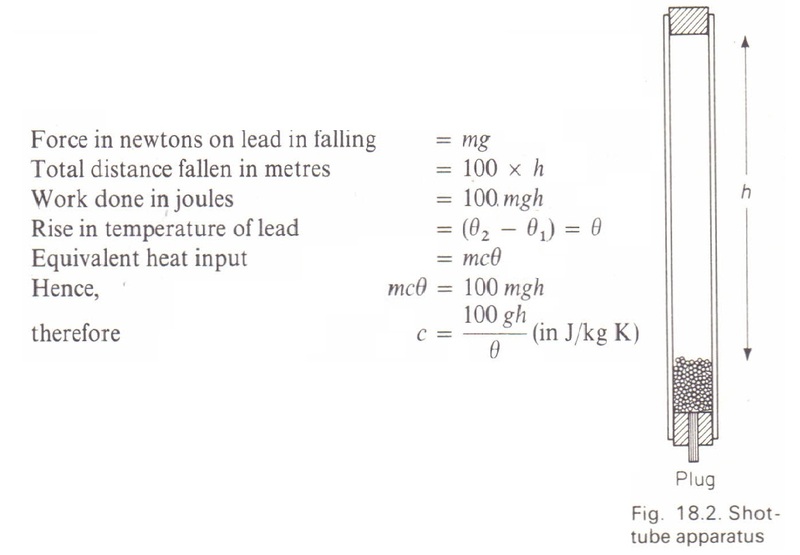 The experiment we shall now describe illustrates the transfer of potential energy to internal molecular energy, and may be used to find a rough value for the specific heat capacity of lead. A cardboard tube about a metre long contains a quantity, m in kg, of lead shot and is fitted with corks at both ends. One of the corks has a small hole plugged with a wooden peg. This allows for the insertion of a thermometer to take the temperature of the shot (Fig. 18.2). If the tube is inverted, the shot falls through a distance h in m. In so doing its potential energy, mgh in J, becomes transferred to kinetic energy which, in turn, becomes internal molecular energy when the shot is brought to rest. The temperature, 01, of the shot is taken immediately before the experiment starts and the tube is then inverted 100 times in order to obtain a measurable temperature rise. The final temperature, O2, of the shot is noted. Note that the mass of the lead disappears from the final calculation, and therefore the mass of the shot does not have to be known. This experiment is worth trying as a Shot matter of interest, but the reader is warned not to expect a very accurate result. There are two main sources of error. First, the whole of the shot does not fall through h, as some of it inevitably begins to slide before the tube reaches a vertical position. Secondly, the shot cools in falling through the air. The air thus gains some of the internal energy produced, and this, in turn, is lost to the cardboard.